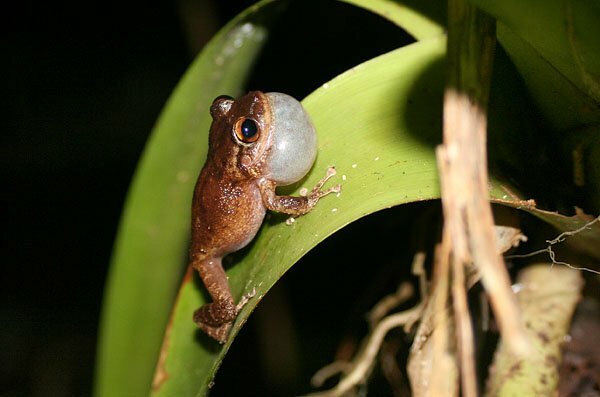 Puerto Rico is home to a huge range of important and threatened animals and plants, and we’re very grateful to Alberto López-Torres for this excellent post on the (mostly) endemic Eleutherodactylus genus of frogs – known to every Puerto Rican as ‘coqui’. Although this post is not about birds, it is still an interesting topic to discuss because amphibians are an essential part of the diet of many birds like: egrets, herons, owls, thrushes, etc., and if something were to happen to them, birds would probably be affected also. Another important reason to write this post is that the Caribbean is considered to be one of the geographical regions with the most threatened species of amphibians. According to the Global Amphibian Assessment (GAA), Puerto Rico itself ranks fifth in the list of countries with the highest percentage of threatened amphibians – with 72.2% of its species threatened (IUCN 2006). In just the last 30 years, Puerto Rico has possibly lost three of its endemic amphibian species: Eneida’s Coqui (Coquí de Eneida) Eleutherodactylus eneidae, the Web-footed Coqui (Coquí Palmeado) Eleutherodactylus karlschmidti and the Golden Coqui (Coquí Dorado) Eleutherodactylus jasperi. I’m sorry to say that I don’t have any pictures of these species because they were extinct before I started to study and photograph amphibians. These species had very unique characteristics, like a high degree of habitat specialization and even being able to give birth to live offspring (as in the case of the Golden Coqui, the only ovoviviparous frog of the New World). The Common Coqui isn’t the only species belonging to the genus of Eleutherodactylus in Puerto Rico, but many Puerto Ricans don’t know this. There are actually 16 more species belonging to this genus, all of which are endemic to the Puerto Rican Bank. This is the dominant genus of amphibians on the Island: 17 of Puerto Rico’s 19 amphibian species are Eleutherodactylus and this is why this post is concentrating on this genus. In Puerto Rico, there are various Coquis with very limited distribution. The Burrowing Coqui (Coquí Duende) Eleutherodactylus unicolor, the Warty Coqui (Coquí Martillito) Eleutherodactylus locustus, the Ground Coqui (Coquí Caoba) Eleutherodactylus richmondi (below), the recently discovered Plains Coqui (Coquí Llanero) Eleutherodactylus juanariveroi and the Rock Coqui (Coquí Guajón) Eleutherodactylus cooki. All of them are in a precarious state. Most of these species have suffered the ecological consequences of habitat loss because of Puerto Rico’s history of land use, in which most lands were used for agriculture before the 1950s. Now new threats emerge, with housing and road developments, which have intensified, thus maintaining fragmentation and habitat loss as a threat for amphibians in Puerto Rico. Declines are also occurring in protected areas, where suitable habitat is still available. Synergies between climate change and a pathogenic fungus are suggested as the culprit of declines and local extinctions on highlands above 600 meters on the island, while lowland species are not being affected. The Mona Coqui (Coquí de Mona) Eleutherodactylus monensis (photo below) is another species with very limited distribution because it is only found on Mona Island, a 13,638 acre/5,519 hectare island to the west of Puerto Rico’s main island, but there is no data on the current state of this species. The rest of the species of coquis have widespread distributions. The Antillean Coqui (Coquí Churí) Eleutherodactylus antillensis (photo above), is easily distinguished from other species because of its red eyes. It can be found from low to high elevations, but it prefers disturbed areas as its habitat. The Whistling Frog (Coquí Pitito) Eleutherodactylus cochranae is a small species that can be commonly seen in many gardens calling from bromeliads. The Grass Coqui (Coquí de las Hierbas) Eleutherodactylus brittoni, like E. antillenisis is also commonly found in disturbed areas next to roads and forest edges. The Tree-hole Frog (Coquí de Hedrick) Eleutherodactylus hedricki and Cricket Coqui (Coquí Grillo) Eleutherodactylus gryllus (photo below) are two species that are found in the canopy of forests at high elevations, making them amongst the hardest species to observe. Other species that are found only at high elevations are the Puerto Rican Coqui (Coquí de Montaña Alta) Eleutherodactylus portoricensis (photo above) which also has a two note call like the Common Coqui (CO-KEE) but which is much faster when compared with the call of the Common Coqui, and the Wrinkled Frog (Coquí Melodioso) Eleutherodactylus wightmanae which is mainly found on the forest floor or on low perches. For more on the Eleutherodactylus visit Proyecto Coqui, an NGO that does research, protects lands and educates the public on the importance of conserving Puerto Rico’s biodiversity, especially the herpetofauna. The website is in Spanish but on the home page there is a ‘clickable’ slideshow that allows you to see and listen to all of the species of Eleutherodactylus in Puerto Rico. Love the coquis and do miss them in the evening when I’m not on island – here we only have E. antillensis, coqui and a species called schwartzii which I think may be endemic to our end of the chain. I am getting a bit tired of moving them out of the bath before showering though! A sad fact concerning the Plains Coqui -Puerto Rico’s most recently discovered vertebrate – is that the wetlands it inhabits are privately owned and both the owner and the municipality of Toa Baja are opposing the “Critical Habitat” designation for the species by the Department of Natural and Environmental Resources. It seems (and indeed is) sad that the fate of such a magnificent creature is bound to political and economical forces seeking the exploitation of the land, whatever the consequences. Can you add the Mona Coqui?